That most English of cars, the little Triumph Mayflower, seems the unlikeliest candidate for a trip to Brazil. But here it is, bravely tackling a hill coming out of Leblon, a suburb of Rio de Janeiro. This was still the time of ‘Export or Die’ for Britain. Following the second world war the government controlled the supply of steel: in 1947 this metal was available only to businesses exporting at least 75% of their production. 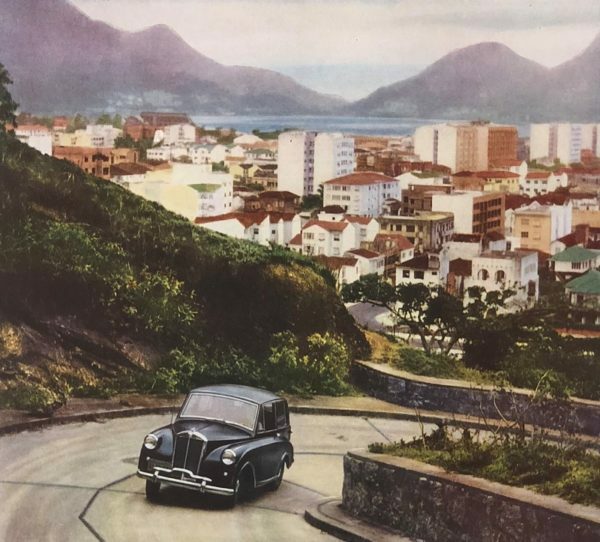 The strategy was successful: in 1937 the UK provided 15% of world vehicle exports, but by 1950 that figure had reached 52% – so the appearance at this time of a left-hand-drive Mayflower in South America is perhaps not so surprising. The Triumph Mayflower was an ill-fated attempt by the Standard Motor Company to produce a small luxury car that would appeal, in particular, to the American market. Sold by Standard’s subsidiary, The Triumph Motor Company (1945), it was announced at the October 1949 British International Motor Show but deliveries did not commence until the middle of 1950. 35,000 were made in the production years of 1949 to 1953, but the company’s next car, the Standard Eight of 1953, was a basic 800 cc economy car aimed at a totally different market. One of the nine prototype Triumph Mayflowers was tested by the factory for 5,000 miles across Europe in 1950, including the use of the “Nessonvaux Piste” – the rooftop test track of Impéria Automobiles near Liège in Belgium where Standard-Triumph also assembled Standard Vanguards and other Standard-Triumph products in the 1950s. One advantage of the car’s upright styling was that it could seat four people in comfort despite its small size. If any proof were needed of this, the well-known 1955 painting by Australian artist John Brack – The Car – http://www.ngv.vic.gov.au/explore/collection/work/3139/ features a Triumph Mayflower carrying a family of four. But there were complaints at the car’s launch that the rear seats were constrained by the rear axle and were too narrow as a result. Which may explain why the parents up front are smiling and the children at the back are less happy. The Mayflower was the first car with unitary construction to be manufactured either by Standard or Triumph. The body was designed by Leslie Moore, chief body designer of Mulliners of Birmingham with input from Standard’s Walter Belgrove. The body shells were built by Fisher and Ludlow at Castle Bromwich, Birmingham. The Mayflower used a version of the pre-war Standard Flying Ten’s 1,247 cc four-cylinder side-valve engine updated with an aluminium cylinder head and single Solex carburettor, developing 38 bhp. Which brings us back to our Snapshot. The Motor in 1950 tested an example at Brooklands and recorded a top speed of 62.9 mph and acceleration from 0–50 mph in 26.6 seconds. ‘Bravely tackling’ the hill out of Leblon is thus almost certainly an appropriate phrase.